Pointer control, intuitive and easy to read, LCD display, automatic calculation of impact results. 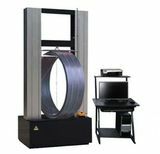 Tensile impact testing machine is mainly used for testing the energy required for fracture of plastic samples under the specified tensile impact speed. 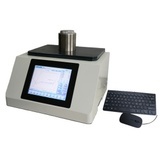 It is used to determine brittleness and toughness of nonmetallic materials such as plastics. GB/T13525 "test method for tensile impact properties of plastics"
ASTM D1822-2006 "test method for tensile impact energy required for fracture of plastics and electrical insulating materials"
ISO 8256-2004 "plastics tensile determination of impact strength"
4) pendulum preheating angle: 150 degrees. Working Principle: One end of the specimen is fixed on the jig of the pendulum impact testing machine, the other end is fixed on the T-shaped head. The energy is provided by the one-way swing of the pendulum, and the T-shaped head is impacted. The specimen is destroyed at a higher tensile deformation rate. The T-shaped head is thrown out together with a part of the specimen, and the energy consumed by the pendulum and the specimen are measured. The tensile impact strength and the permanent elongation at break of the specimens were calculated after calibration. The test results of different types or sizes of samples can not be compared. 1. The pendulum of the testing machine must be a rigid pendulum. 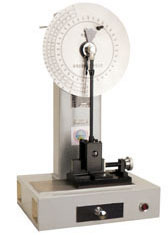 When impacting a specimen 2 mm thick, the physical impact center of the pendulum must coincide with the thickness center of the specimen. 2. The clamp of the testing machine must not cause the sample to be clamped to break and slide during the test. The clamp claw may have a file-like tooth, and the tooth size may vary according to the sample. 3, the T-shaped head should be made of light and very low elastic material, and plastic deformation will not occur when subjected to impact. 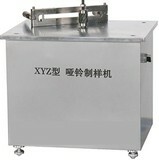 Sample: the sample is made by injection or mechanical processing. Thin film or sheet sample can be cut by punching knife. The phenomenon of overheating of samples is not allowed during sample preparation. 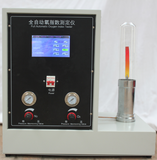 If coolant is used in mechanical processing, the performance of the sample shall not be affected. The specimen should be free from damage, with no defects and uniform thickness. The marking of specimen gauge should not affect the performance of the sample. Hard material specimens shall not be twisted. If the tested materials show different tensile impact properties in all directions, they should be sampled in different directions. Sample size and shape: 1mm is preferred for specimen thickness. The sample cut from the product should be kept at the original thickness; the specimen with a thickness greater than 4mm should be machined to 4mm. For thin films, multi-layer specimens can be used but should overlap well. Sample size: at least 5 samples or according to product standards. Select the appropriate pendulum to make the impact energy reading in the effective range of the tester. (try to choose a small T-shaped head on the premise of clamping the sample). D - the thickness of the specimen is millimeter (mm). H - the width of the specimen is millimeter (mm). The test results were expressed by the arithmetic mean of tensile impact strength of each group, and 3 effective figures were obtained. Since the energy Ws consumed by the pendulum impact specimen includes the energy consumed by the T-shaped head flying out, the energy must be corrected to calculate the energy consumed by the specimen failure. The energy consumed by the corrected specimen is calculated according to formula 2: W.
W "- energy consumed by specimen failure during inelastic collision.